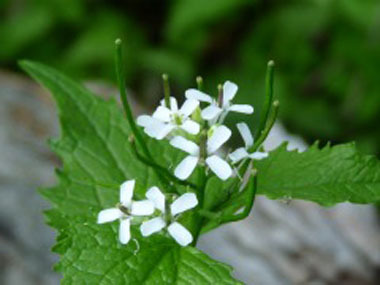 Garlic Mustard is a biennial herb that has been labeled an invasive weed in many areas. 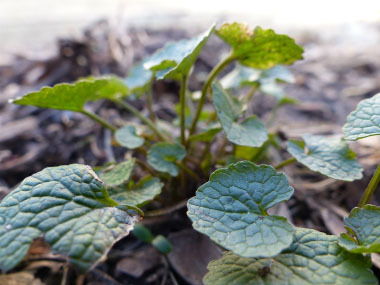 Originally from Europe, this nutritious plant is found in many locations across North America. 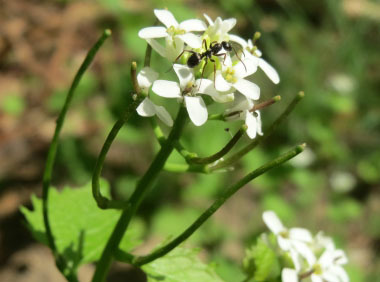 The flower of this wild edible only appears from May to June. 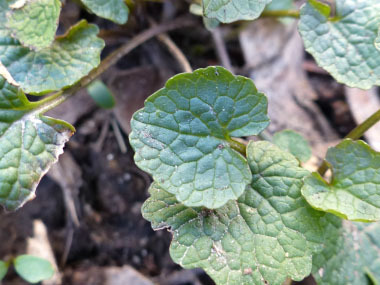 Garlic Mustard is good for your weight, heart, lowers cholesterol, may help prevent cancer, as well as many other health benefits. Distinguishing Features: Broad heart-shaped or kidney-shaped leaves, coarse, rounded teeth, petite flowers, onion or garlic odour, slender pods that contain the seeds. 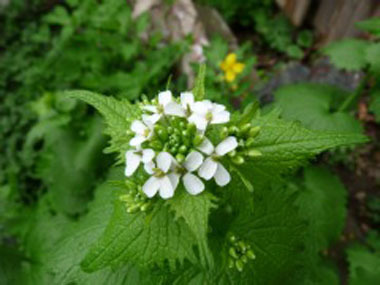 Flowers: Garlic mustard flowers are easy to recognize. The outside of the mustard flower has four sepals, usually green. The flower itself has four petals usually arranged in the shape of a cross. It has six stamens: four are tall and two are short. Flowers usually appear in a cluster. Each flower measures 1 to 1.5 cm across. Flowers can appear at any time throughout the growing season of year two of the plant's growth. 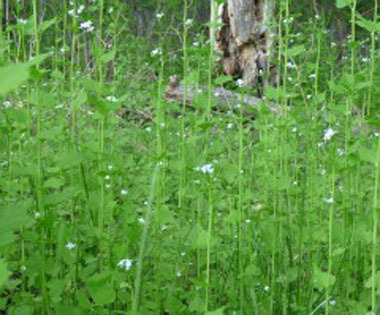 Fields of Nutrition has medicinal benefits and vitamin/mineral content of Garlic Mustard. Leaves: Leaves grow one to seven centimetres in diameter and are anywhere from kidney to heart- shaped, with large rounded irregular teeth. First year plants have just a rosette of smaller round or kidney-shaped leaves with scalloped edges. Leaves may be hairless or hairy to varying degrees. Height: 10 cm. to 1 metre. Habitat: Grows across many areas of Canada and the U.S. along fence lines, wooded areas, swamps, ditches, roadsides, railway embankments and takes advantage of disturbed areas. This plant is often found in open disturbed forests. For more in-depth information (e.g. nutrition, medicinal values, recipes, historical information, harvesting tips, etc.) 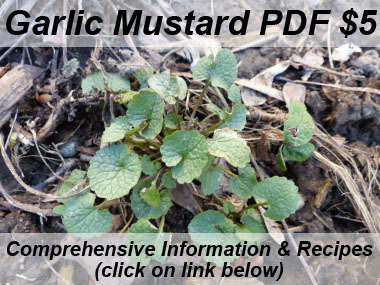 please check out our Garlic Mustard PDF magazine.